And what about lenses? I had the 80-400mm f/4.5-5.6 and the 500mm f/4 for the two F-mount cameras, the 70-300mm CX for the the V3 (if you’re looking for one of these in the US, drop me a line as I know a dealer with one in stock). Which lens did I keep coming back to? The 80-400mm. Despite the f/5.6 aperture at 400mm. Let’s put this in perspective: I’ve been regularly traveling to Africa for 20 years to shoot photos. I think I have a pretty good idea of what the optimal gear for me should be. I’ll give you a hint: it’s not the biggest, best, fastest, least noisy options that I prefer. Everything is about balance. What’s the proper balance of options that gives you the best chance of getting the shot you want? Let’s take that 500mm f/4 first. Everybody’s top wildlife lens, right? Well, maybe, if you’re shooting from very long distances or only want head shots. 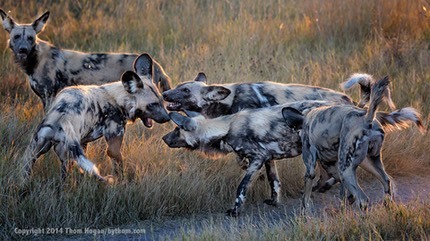 What happens when you have the wild dogs right at your vehicle’s side? Or eight lions laying in ambush? 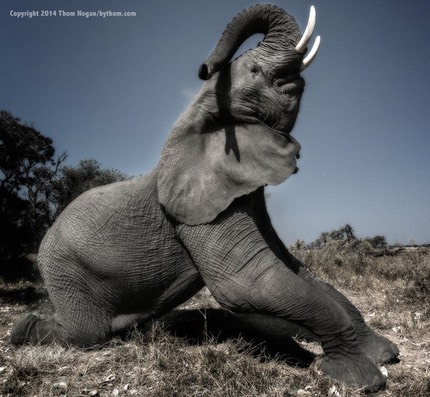 Or the elephant chases the leopard right by your vehicle? 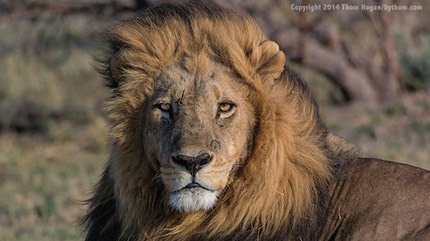 On a DX body, I often found myself shooting eyeballs or whiskers when I only brought the 500mm into the vehicle. Eventually you get over the fact that you’re seeing and shooting wild animals at close range. That’s when you begin to discover that flexible and balance will get you the real shot more often than reach and speed. Here’s one way to measure that: is the story that prompted you to take the photo visible in the resulting image without you having to tell it verbally, or do you have to explain the photo to everyone in order for them to understand why it’s exceptional? More so than ever, I’m now wondering why Nikon took so long to add AF-S to the 80-400mm. This lens—like the Canon 100-400mm—is a pretty important lens for a far larger number of photographers than adding minor features to the 400mm f/2.8 or coming out with yet another normal prime. That’s because a really well-designed telephoto zoom gives users lots of flexibility. Indeed, the recent Canon 200-400mm f/4 trumps the Nikkor version with that built-in teleconverter that can be switched in at will. Canon’s zoom is really a 200-560mm f4-5.6 zoom, the Nikkor is only a 200-400mm f/4. It doesn’t hurt that the Canon has more acuity, either. But what about taking out distracting backgrounds and creamy bokeh, you say? Well, that looks good for head shots, but those things are not at the top of my list when I find myself in a shooting situation that requires flexibility. And frankly, those situations are the ones that create more unique photographs for me than “isolate animal from background” shots. Once you have a good lion shot isolated from background, how many more do you need? While I’ve always recommended the 200-400mm f/4 as a versatile lens for most African and wildlife situations, I’m adding the 80-400m f/4.5-5.6 as another perfectly appropriate lens. Especially given how far our image sensors have come in terms of handling low light situations well. And don’t forgot the 24-70mm and even the 70-200mm. These days I tend to cover the 24-70mm range with a pocket camera, such as the Sony (but note all the new options that popped up at Photokina). The 70-200mm I took with me this trip got the least use, amazingly, and mostly because I found the 80-400mm to be holding its own. Again, that f/4-5.6 aperture doesn’t give you as much ability to soften the background, but I often just move the Land Cruiser so I have a better background ;~). Let me put things a different way. 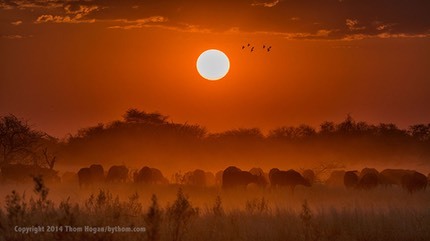 If back in 1999 you had offered me a great ISO 1600 film and a 120-600mm f/5.6 lens, would I have taken them to Africa? You bet I would have. That’s exactly what we have in the D7100 with an 80-400mm lens. I’ll have more to say about the D810 and the 70-300mm Nikon 1 lens (positive, for all of those out there that think I can only write negative things about Nikon products ;~) when I review those products shortly. I’m not going to do a blog from this year’s workshops. There’s plenty for you to already read in the previous three Africa blogs I’ve done. I will say that this year’s back-to-back workshops were the most productive month I’ve spent in Africa, and it seemed like virtually everything came out to say hello to me this year. If I had done a blog, we’d be scrolling through thousands of images, I think. Let me put it this way, within 30 minutes of getting off the bush plane at our first location, we found a wild dog den with pups. We found hyena den with cubs, cheetah with cubs, walked into the middle of a pride of lions hunting, walked with elephants, had a leopard kill and a lion kill on either side of one morning’s tea break, and plenty more that would get your adrenaline pumping and your buffer filling. My next wildlife workshop is in the Galapagos in November/December 2015 and there are still spaces open. We’ll be doing this on the best boat in the Galapagos for small groups, and spending a full two weeks using smaller split groups of 8 as I did last time. Don’t miss this trip if you want to learn to shoot wildlife or want the ultimate Galapagos experience. I won’t be doing another wildlife workshop until summer of 2016, by the way.